“7 Year Itch” – Strychnin Gallery’s Anniversary show! 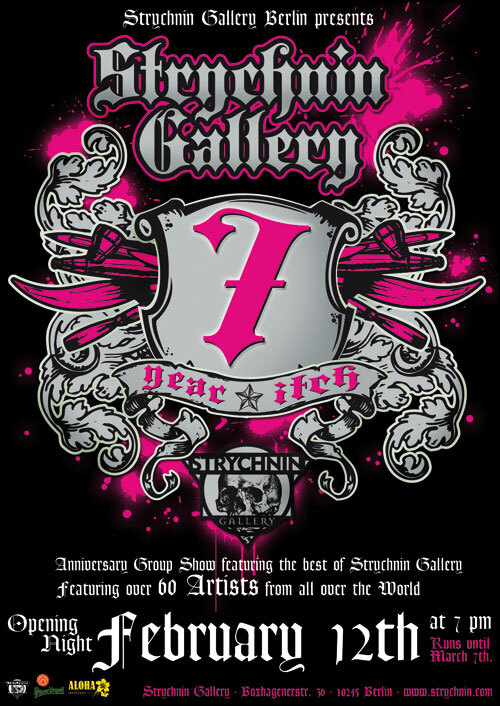 2010 is Strychnin Gallery’s 7th anniversary! To celebrate this, as well as starting the year with a bang, the gallery in Berlin will be hosting an amazing group show featuring over 60 international artists. Gathering together those who have shown with Strychnin previously, as well as some new blood, “7 Year Itch” will bring different media ranging from painting to photography, assemblage, etching, digital painting, sculpture and drawing to light engraving to Berlin. Featuring some of the best pop surrealism, neo-baroque, urban art, and fantastic realism today, it will definately be worth braving the cold for! Leslie Ditto, Wee Flowers, Lisa Mei Ling Fong, Annie Bertram, Seymour, Mimi S., Jason Limon, Richard Kirk, Beth Robinson, Raf Veulemans, Sophie Bastien, Edith Lebeau, Tim Roosen, Ver Mar, Miraschi, Squp, Gothic Hangman, Scott Holloway, Chris Peters, Jan Czerwinski, BORIS + NATASCHA, Tim Conlon, Till Krautkraemer, Alexander Sterzel, François Escalmel, Daniël van Nes, Kristen Ferrell, Bethany Marchman, Jon Jaylo, Marmite Sue, Damon Soule, Christian Rothenhagen, Virginie Ropars, Suzzan B., William McDermid, Lesley Reppeteaux, Nicoletta Ceccoli, KRK Ryden, Manuel Cortez, Christina Graf, Dirk Larsen, Ansgar Noeth, Elmer Presslee, Scott Radke, CANTWO, Zaelia Bishop, Chris Bonobo, Guillermo Rigattieri, Mayo, Cliff Wallace, David Hochbaum, Mark Verhaagen, Gene Guynn, Benjamin Vierling, Chrisitee, Diva, Martina Secondo Russo, Marcus Poston, Aaron Board, Daniel Elson, Carole Bielicke and others. This entry was posted on January 21, 2010 by strychnin in Uncategorized.